In December 2016, in the abandoned and ruined town of Pisky (Donetsk Region, Ukraine), I found a photo lab in the building of Donetsk Agrarian Institute. Due to the constant shelling, all windows were broken for a long period of time. In this laboratory, I found two unused reels of expired 120mm Film, which was produced 30 years ago. Over the past three years, the building experienced a severe frost, hot summer air, autumnal moisture, snow, rain etc. I took the reels, but I doubted they will be useable. Two months later, in the Carpathian Mountains, I decided to give it a try. I loaded the old Zeiss Ikon photo camera with the cassette, I found 1,500 km away in the East. The result astonished me: I got several stylish, old-fashioned images when I developed the Film. 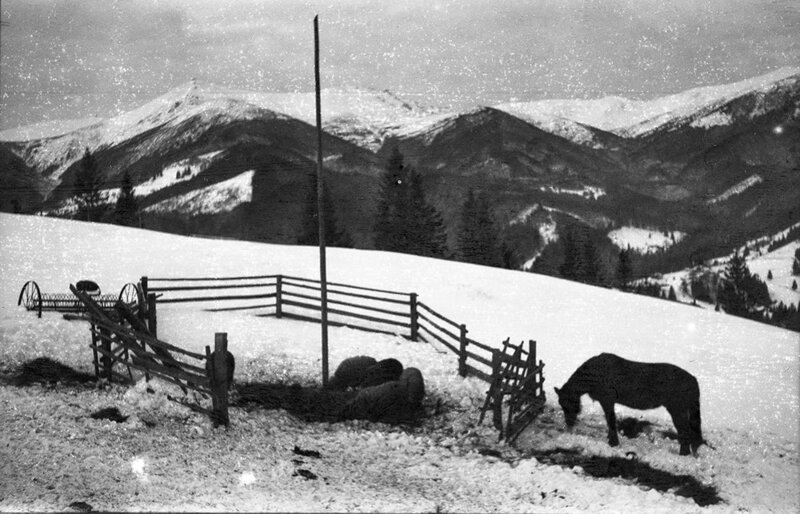 When I was shooting Mountains in western Ukraine on the Film from the East, I was not thinking about such a symbolism. 98 years ago, one year after the declaration of independence from Russia: the western and the eastern parts of Ukraine were united for the first time after centuries of the division of Ukrainian lands and its people between the Golden Horde, Poland, Lithuania, later Russia, Ottoman, Austria, and Hungary. This state lasted just a few months, but it was important for understanding Ukraine as a holistic nation and the country, and this understanding laid the foundation of the struggle for independence of the united country.